Wtf? Don't be mistaken by the entry title.... This is going to be a very tame post! 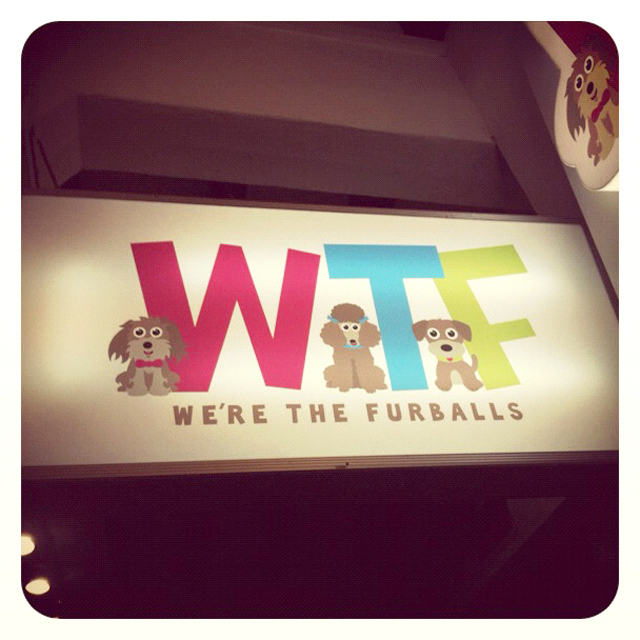 Nadia gathered us for a little meet up at WTF (We're The Furballs). Interesting ya? Did not bring my camera along that day so I took all the photos using Iphone... Photo quality lousy max. What a pity! There are two levels. 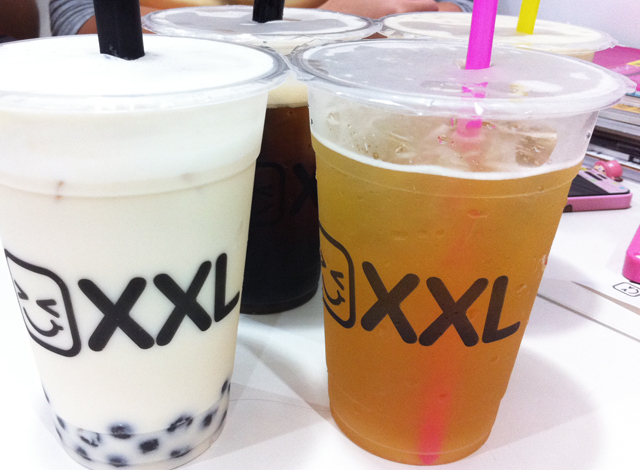 Level 1 is XXL, a bubble tea and snack cafe. In order to go up to Level 2 to play with the dogs, we were required to pay an entrance fee in addition to the food we order. I think there is different pricing for different days of the week, but very affordable! And off we go upstairs! To be honest, I'm not particularly a dog lover, or even animal lover. I don't think I would have volunteer to visit such places if not for Nadia! I love looking at cute animals but I don't have the urge to pick them up and cuddle them. I'm actually quite neutral about them, and sometimes afraid of them, especially fierce ones! 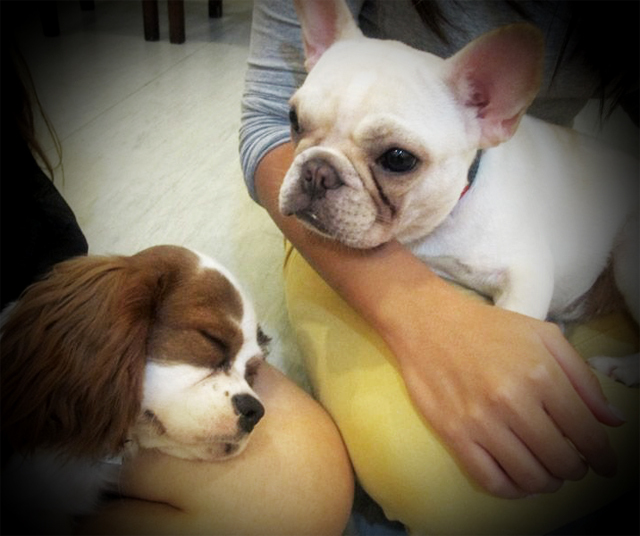 This cute dog (Duchess) on the left unexpectedly climbed up my lap and laid there comfortably! I liked that dog immediately. Hehe. And the one on the right (Lola) was my favorite out of all the dogs there. Purely because it looked the cutest. It was so fragile to hold though. 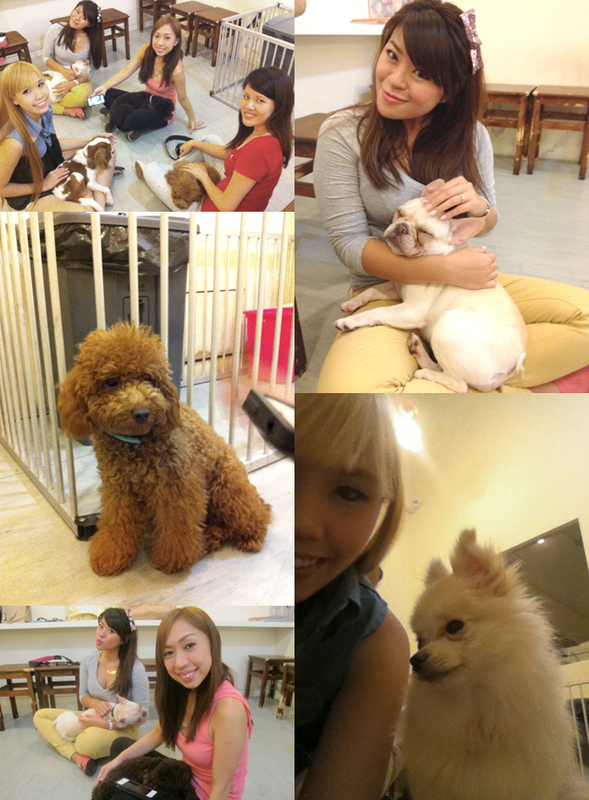 Everyone had one dog each on our laps! The bulldog kept clinging onto Fidelis and refused to let go! Lol. And check out my failed attempt to take a photo with Lola. Haha. It keeps refusing to look at the camera! Close up of Duchess sleeping so soundly and Buibui who was indeed very bui. Haha. It was a very fun experience! 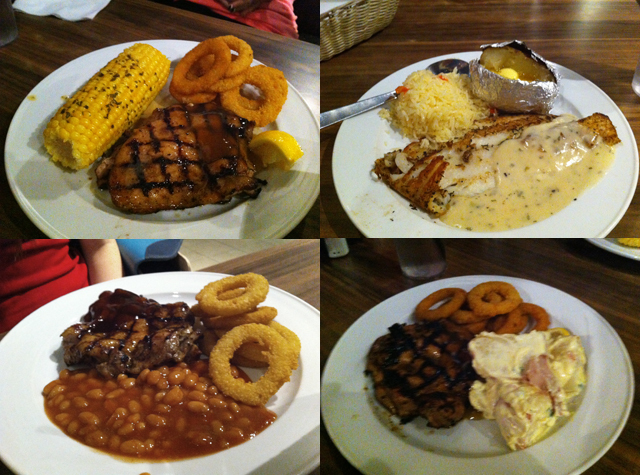 Went to Aston afterwards for late dinner! Was great catching up with the girls. Now 3/4 of us are engaged already, with Nadia and Jacelyn ROM-ing by end of this year and Fidelis' recent proposal by Leon. Everyone is so xingfu now! Fidelis' ring is gorgeous! 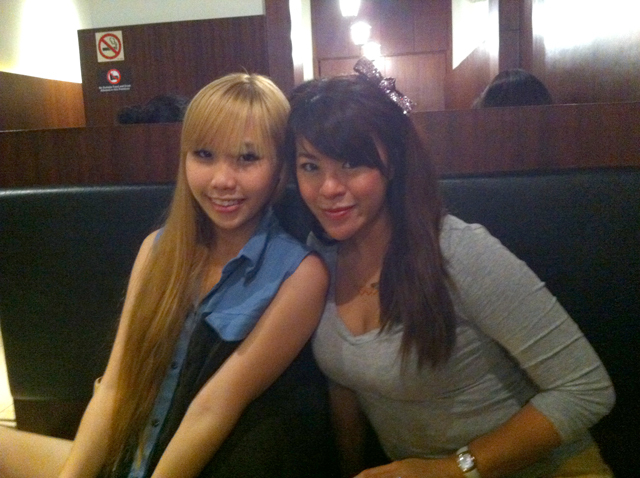 My top is from MissQueenie :) It's denim and sheer black chiffon! The dogs are so cute! 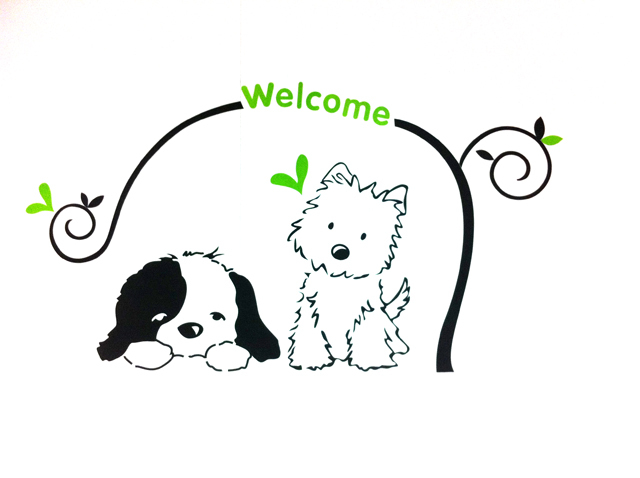 ^_^ I didn't knew there were such cafes that allows dog interactions! Hi, can you tell me where is this place ? 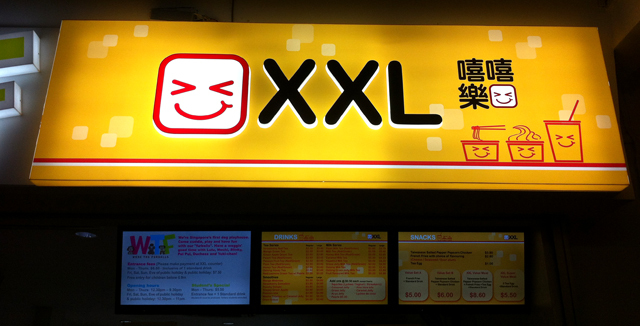 the XXL shop? where there is a dog at level 2 :D Thank you! How much you paid for the entrance fee? I think it was $7.50 for entrance including a free drink. Sorry sorry! Is Chihuahua! Hahaha stupid mistake. 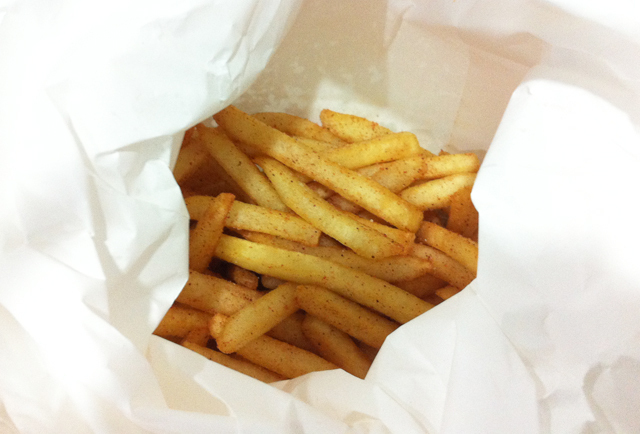 OMG, I so need to come to this place! Btw, barking chinchillas? ?